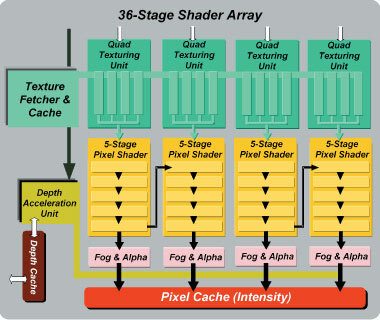 Four programmable vertex shaders are used opposed to two for the Geforce3/4 and the Radeon 8500, four pixel pipelines identical to the competition are also present, but each with nine stages consisting of a quad texturing unit and a five stage pixel shader. This adds up to the Parhelia’s much mentioned 36 stage rendering array. As each pixel pipeline has a separate set of four texture units, the Parhelia will be able to apply four textures to four pixels every clock cycle. This in comparison to the Geforce4, which can apply four textures to two pixels every clock cycle, and the Radeon 8500 which is similar. The pixel shaders on the Parhelia have five stages per pipeline. They can be linked in groups of two, so up to ten effects can be applied to two pixels per clock, or five to four pixels per clock. The programmable pixel shaders are version 1.3 from DirectX 8.1, while Matrox claims the vertex shaders are DirectX 9 compatible.